Universe of Sound: The Planets, a major digital installation that leads to a weekend exploration of music and space presented by Town Hall & Symphony Hall with the Philharmonia Orchestra and featuring free family activities, film screenings and live performances, will take place in Birmingham in June 2013. The world-class orchestra is to take on a virtual form in the free and interactive installation, which will be resident in the disused Birmingham Municipal Bank between Saturday 25 May and Sunday 16 June 2013. Universe of Sound: The Planets, which has been devised and created by the Philharmonia Orchestra Digital Department and Principal Conductor and Artistic AdvisorEsa-Pekka Salonen, will transport visitors into the heart of a symphony orchestra. Visitors will be able to conduct using creative digital technologies, play live and virtual instruments and learn about the roles of musicians and composers in ten separate rooms, before a planetarium-style full-dome 360 degree projection delivers the incomparable thrill of seeing and hearing 105 players performing Gustav Holst’s incredible work The Planets, conducted by Esa-Pekka Salonen. Each room will contain the sheet music for each instrument, and visitors will be invited to bring their instruments and play along. Philharmonia and locally based musicians will also be present inside the installation, playing along live and answering questions. Universe of Sound – Birmingham 2013 from Philharmonia Orchestra on Vimeo. 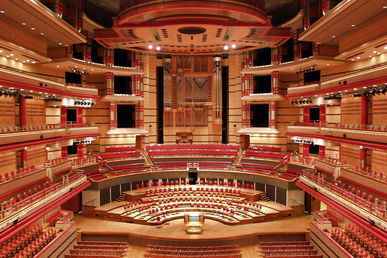 On Friday 14 June, Universe of Sound‘s final weekend commences with a 7pm screening of Stanley Kubrick’s classic science-fiction movie 2001: A Space Odyssey at Symphony Hall, accompanied by the original soundtrack performed live by the Philharmonia and Birmingham’s Ex Cathedra choir, conducted by Benjamin Wallfisch. Majestic, unconventional and instantly recognisable pieces of music feature in the 1968 film, which is now acknowledged as one of the greatest and most influential films of all time. Concert ticket holders will have the opportunity to experience a late night performance of Earthrise, Alec Roth’s 2010 choral masterpiece based on the view of Earth by Apollo 8 astronauts whilst in orbit, given by Ex Cathedra in Symphony Hall from 10pm. The family friendly space of Symphony Hall Café Bar will be the base for the Universe of SoundFamily Day, a day of free activities, workshops and demonstrations between 10.30am and 4.30pm on Saturday 15 June, featuring musicians helping families to explore the orchestra, solar system mobiles, demonstrations of music technology, a constellation installation, creative workshops themed music and space plus much more. The Universe of Sound weekend closes with Gustav Holst’s great astrological work The Planets, performed by the Philharmonia Orchestra and ladies of the City of Birmingham Choir conducted by Vladimir Ashkenazy in Symphony Hall, on Sunday 15 June 2013 (7.30pm). The Universe of Sound: The Planets digital installation in Birmingham is sponsored by Birmingham City University with support from THSH partner Norland. The performance of 2001: A Space Odyssey is sponsored by Investec Wealth & Investment. The creation of Universe of Sound was made possible thanks to generous support from Arts Council England, the Eranda Foundation, the Esmée Fairbairn Foundation, the Foundation for Sport and the Arts and the Paul Hamlyn Foundation. An interactive Blu-Ray and DVD release of the footage and audio has just been released on Signum Records*ray%29/sigbrd001.html to coincide with the installation.